In addition to swimming in the cool, refreshing water, there is a rope swing that gets plenty of action. If you aren’t skirmish, you can dip your feet in the water and the resident fish will give you a free pedicure (as they like to eat away the dead skin from your feet). It’s actually pretty ticklish. If you get hungry, they serve both refreshments and Chipsi Mayai, a local egg dish that translates from Swahili to mean eggs and chips. It’s very delicious. The hot spring is located roughly an hour from Kilimanjaro International Airport and about 2 hours from downtown Arusha. 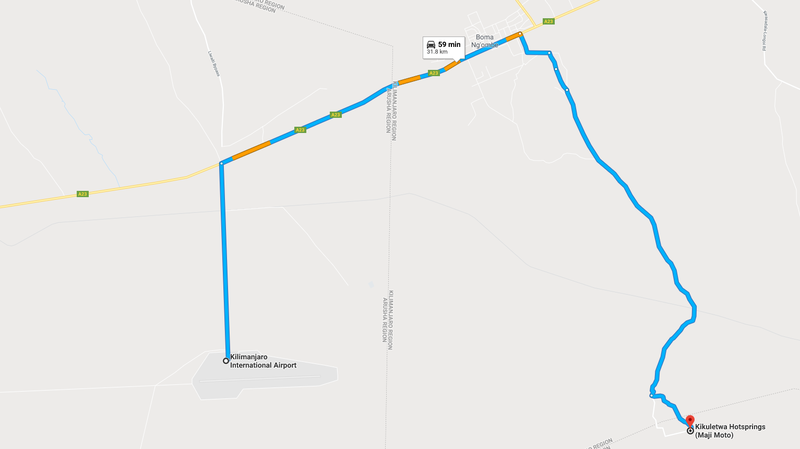 I have included a map with directions on how to get to the Kikuletwa Hotsprings from the Kilimanjaro International Airport for you to review below. If you would like to get a better sense of what the Kikuletwa Hotsprings are all about, check out our short video below. It’s a pretty amazing place. Kikuletwa Hotsprings is a stunningly beautiful place, so getting some great pictures wasn’t too difficult. Below is a gallery of some of the shots we took while at the hot springs. I used to live in Arusha! Tanzania is an amazing country – and chips Mayai is one of my favourite meals. Awesome photos! Awesome!!! It’s a beautiful area. I would love to go back one day. And chips Mayai is one of my favorites too!